Measure around the base of your neck where the collar would sit. Hold one end of the tape measure at your wrist, and measure up to the tip of your shoulder. Wrap the tape measure around the fullest part of your chest, ensuring the tape remains level. Find your natural waist (usually the thinnest part) and measure around your waistband, ensuring the tape remains level. Measure from the inside of your leg at the crotch, down to where the hem of your trouser will sit, just above the shoe. 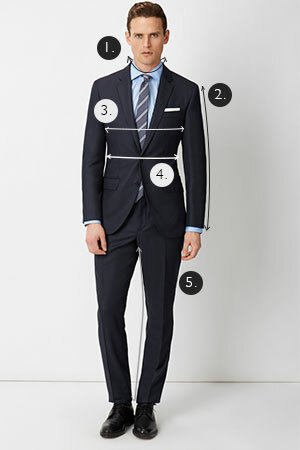 Measure from the base of your neck at the center back down to the hem of the shirt.